Folk Implosion helped put John Davis on the map in 1995, but his solo albums — from his 1997 debut, Blue Mountains, to the upcoming Spare Parts — have kept him there. On his new album, Davis works with eight musicians and three different engineers, rolling everything from strings to lap steel to ambient electronics into his tunes. Read our Q&A with Davis and stream Spare Parts in its entirety below. 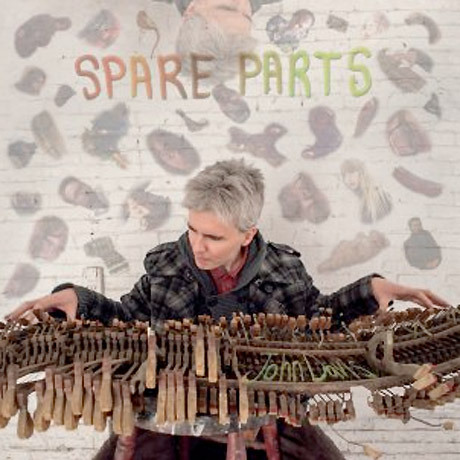 How would you describe Spare Parts? What can fans expect? The songs were written with acoustic guitar and vocals, and those two instruments are the basis of most of the songs. However, the arrangements are intended to diversify the sonic palette of the album beyond a straightforward “acoustic singer-songwriter” album by incorporating sounds and textures that are influenced by things like (post) modern classical music and noisier/artier underground music. Backing vocals by a trio of female singers also play a major role on the record and are intended to provide a contrast in gender and perspective that has to do with the relationships the songs describe. The songs are much longer on this album than anything I’ve done before, which was a conscious experiment. Some of my favorite pop/rock songs, like “Stuck Inside of Mobile” by Bob Dylan, and “Mother Sky” by Can are really long. And then there’s Morton Feldman’s String and Piano Quartet, clocking in at 1 hour and 15 minutes! We’re so conditioned to have short attention spans in this culture, especially in today’s Twitter/text messaging universe. I like how longer form music stretches the frame to include things you might miss in a soundbite. There are fewer songs than on my records from the ’90s. I went back and listened to some of that stuff several years ago and found myself wishing I had limited myself to 10 songs so that the overall product was more tightly focused. I also made a conscious effort not to double any of my vocals, which was a trick I used to use on all my solo albums. How does it feel to be putting out a new record? Great! I’m really happy with the way this record came out. I think I appreciate the positive aspects of the process more because I haven’t made a record in a while. It doesn’t feel like a rote thing – “Oh yeah, another year, another record.” I like that it has a more organic time line that isn’t dictated by a contractual obligation. I’ve been writing a series of posts on my blog called “Top 40 over 40” about artists who defied the odds to pull off a creative growth spurt after 40, when most pop/rock artists’ best records are behind them. Not so much a return to form as a new form that is compelling. These other albums by PJ Harvey, Scott Walker, the Mountain Goats, Mike Ladd and Vijay Iyer, Emmylou Harris, Sun Ra, Morton Feldman, and others inspired me to give it a whirl myself. I tried not to just repeat things I did in the ’90s in faded colors. I’m proud that I did a better job of letting others make a significant contribution to this album than when I was younger. I used to feel more of a need to be in control by playing all the parts myself. I think this is the best solo album I have made for that reason. I’m also proud of the work that Simon Joyner, Jose Medeles, Megan Siebe, Laura Burhenn, Sarah Gleason, Mike Friedman, Chris Deden and our mix engineer Brandon Eggleston put into this project.